This web site on Frances Mary (née Schlee) Meyers is under development. We welcome your input, stories, photographs, documents, and other resources. Frances Mary Schlee was born on September 29, 1911. She was baptized at Saint Boniface R.C. Church, 124 Locust Street, Buffalo, NY, on October 8, 1911. On March 31, 1951, at Saint Nicholas Church in Buffalo, Frances married George H. Meyers. Frances died on January 5, 2001. She is interred in Lot 1754-1/2, Section I, Mount Calvary Cemetery (Pine Hill), Cheektowaga, NY, in a grave adjacent to that of Howard F. Rohe --- the first husband of Frances' sister Eleanor. 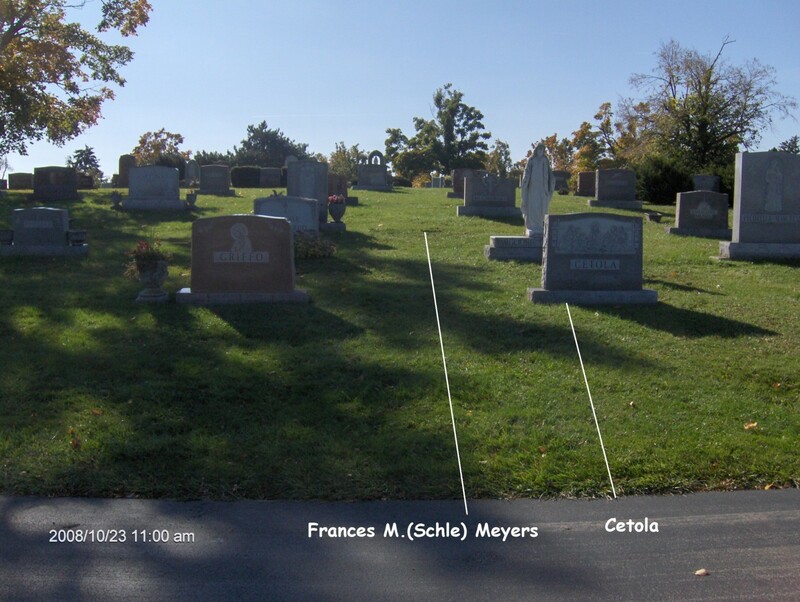 General location of the gravesite of Frances M.(née Schlee) Meyers, Lot 1754-1/2, Section I, Mount Calvary Cemetery (Pine Hill), Cheektowaga, NY. 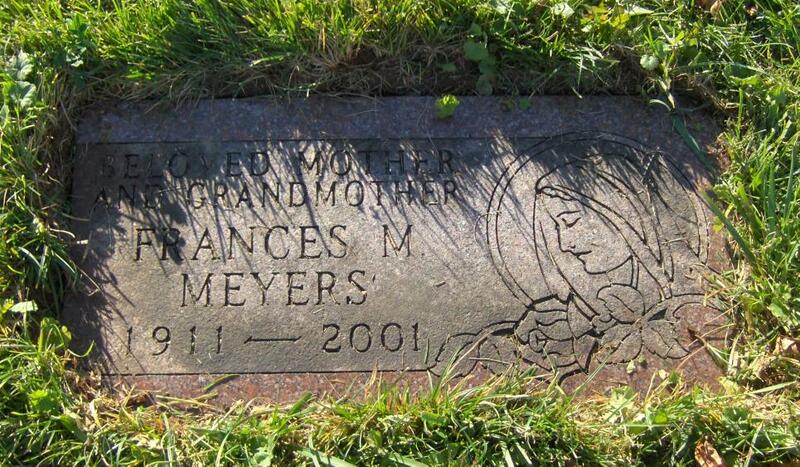 Grave of Frances M.(née Schlee) Meyers, Lot 1754-1/2, Section I, Mount Calvary Cemetery (Pine Hill), Cheektowaga, NY. Baptismal Record: Frances Mary Schlee, daughter of Frank and Christina (née Jacobi) Schlee, born September 29, 1911. Baptized at Saint Boniface R.C. Church, 124 Locust Street, Buffalo, NY, on October 8, 1911. 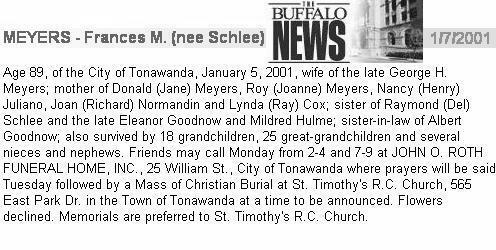 Obituary: Frances M. (née Schlee) Meyers, died January 5, 2001. 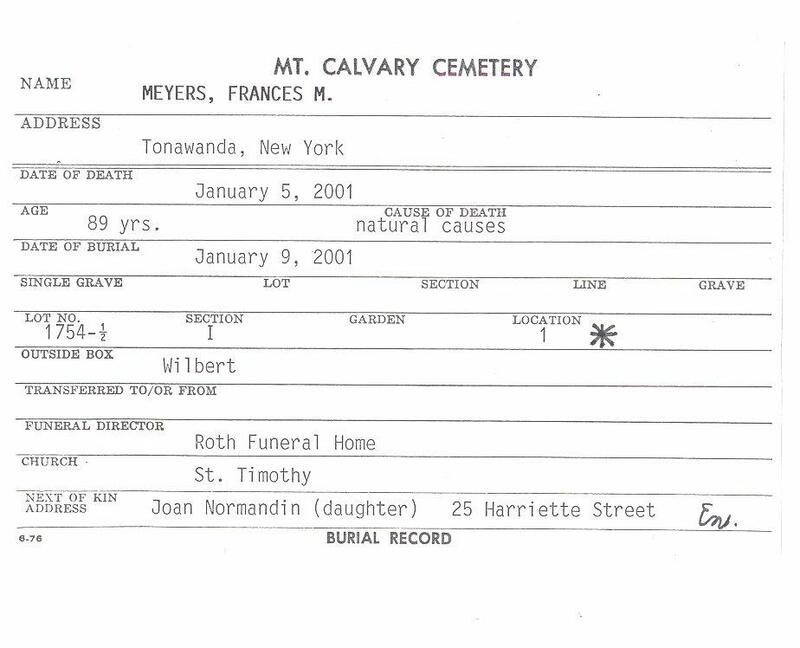 Interment Record: Frances M. (née Schlee) Meyers. Lot 1754-1/2, Section I, Mount Calvary Cemetery (Pine Hill), Cheektowaga, NY. 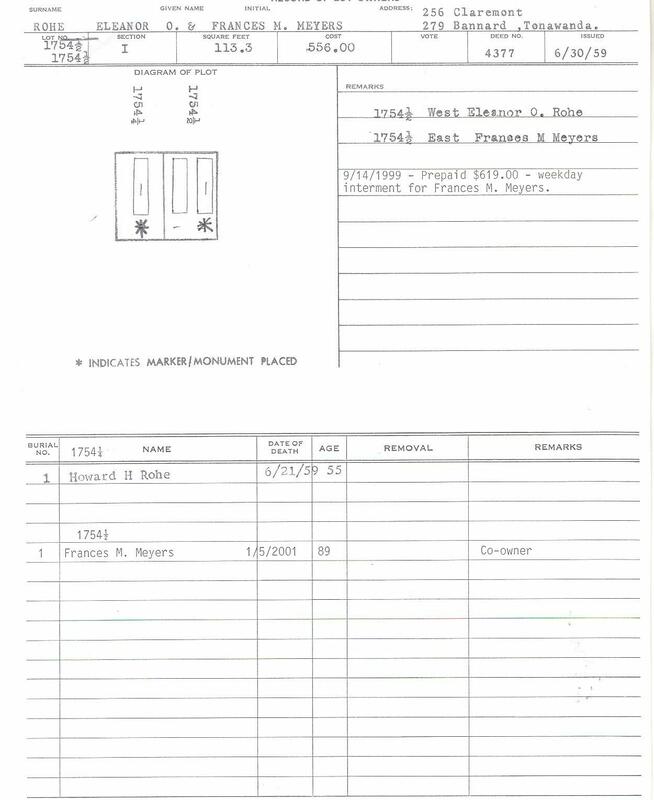 Cemetery Plot Record: Frances M. (née Schlee) Meyers. Lot 1754-1/2, Section I, Mount Calvary Cemetery (Pine Hill), Cheektowaga, NY.